I have always wanted to try endives, but for some reason never got around to it. I have seen a lot of recipes using endives as an appetizer. All the pictures that I have seen always look so pretty. I bought the endives, but then had trouble deciding what to put in it. Out of necessity, I decided to use the endives as part of my main course. 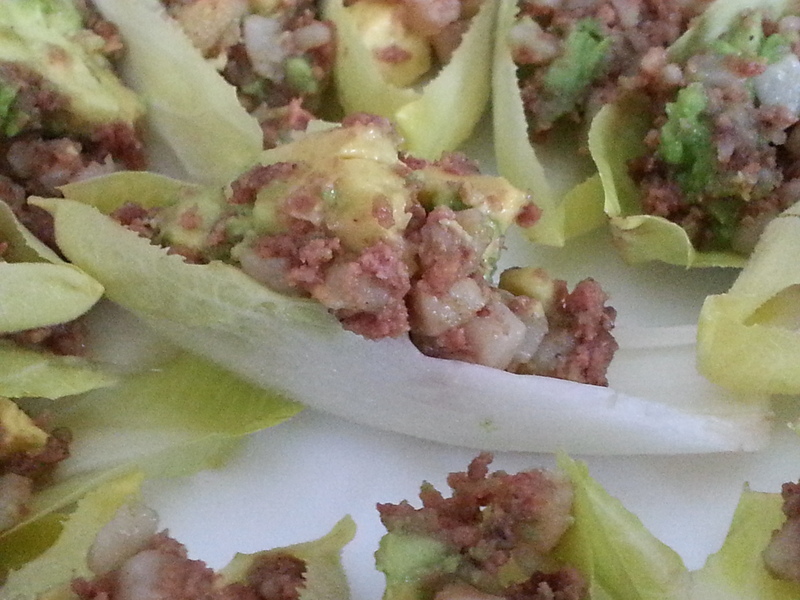 I cooked up some canned corned beef with potatoes, mixed it up with avocado and then scooped some onto each endive. This certainly can be served as an appetizer as well. As I was preparing it, I was quite certain, my son was going to say this was terrible as he does not like corned beef. However, I got the total opposite reaction. Instead he said this was his favourite meal. He wanted to know the name of the meal so that if ever asked what his favourite meal was, he could answer correctly. Sometimes, I do get it right. 2. When the oil is hot, add corned beef and seasonings. Stir fry until the beef is slightly browned. 4. Scoop into the endive leaves.